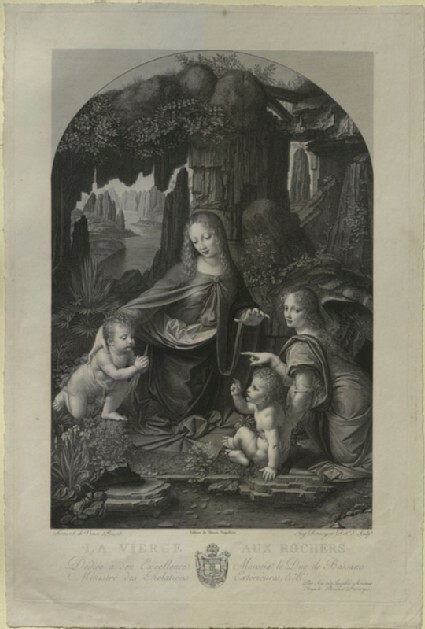 The Virgin kneels, with the infant Saint John the Baptist to the left and the infant Christtowards the right. An angel kneels behind Christ. The figures are set in a rocky grotto, closed off at the back with a series of rocks and boulders, pierced to reveal a distant landscape with a walled city by open water and steep mountains. The print is a reproduction of the version of Leonardo's "Virgin of the Rocks" now in the Louvre. Leonardo painted two versions: the one reproduced here was the result of the commission, first made with the woodworker Giacomo del Maino in 1480, for an altarpiece for the Confraternity of the Immaculate Conception for their oratory in San Francesco Grande, Milan. In 1483, the job of painting an altarpiece was given to Leonardo da Vinci and the half-brothers Evangelista and Giovanni Ambrogio Preda. (The Preda brothers' surviving contributions seemto be the two panels of angels with musical instruments now in the National Gallery, London.) The commission ran on, and the painting may only have been finished in 1508. At this point the central panel of the altarpiece was sent to France, where it entered the royal collection and eventually the Louvre, and Leonardo painted a replica - the version now in the National Gallery, London. Ruskin first listed the print in 1870, as no. 11 in the Standard Series in the "Catalogue of Examples", where henoted that the engraving was not particularly true to the picture - but that this was an advantage when it avoided Leonardo's extreme darkness; it still captured his sense of grace. It also stood as an example of reproductive line-engraving. In his notes on paintings in the Louvre, made on 14 August 1844, he described the flowers in the picture, identifying flags (flag irisses) and aloes (and later, in 1854, borage). Going over his notes in Calais eight days later, he noted how 'the Jesus is very solemn, and the picture has grown upon me exceedingly'. But returning to the Louvre on 8 September 1849, he was already becoming critical of the stylisations of Leonardo's landscape painting, asking of the rocks 'What kind of mind could lead Leonardo to adopt such an ideal? ', before going on to complain of the distant ladscape which was like that in the "Mona Lisa", 'grotesque, blue and unfinished'. (Notes on the Louvre, §§ 6, 8, 20 & 28 = XII.450-451, 456 & 460.) Similarly, in his "Lectures on Architecture" of 1854, he considered the depiction of the rocks to be merely conventional, 'no better than those on a china plate' (§ 86 & fig. 22 (reversed from the painting) = XXI.113-114). just below the image, right: Aug. Desnoyers Delt. & Sculpt. bottom, centre, around a coat of arms: LA VIERGE AUX ROCHERS | Dédiée à son Excellence | Monseigr. le Duc de Bassano | Ministre des Relations | Extérieures, &a. &a. The engraving gives a false idea of the picture in many important points; but it is in some respects more pleasing by refusing to follow Lionardo in his extreme darkness, and it accurately enough represents his sense of grace and the refinement of his delineation. It is a fair example of line-engraving as a separate mechanical art, distinguished from that practised by painters.